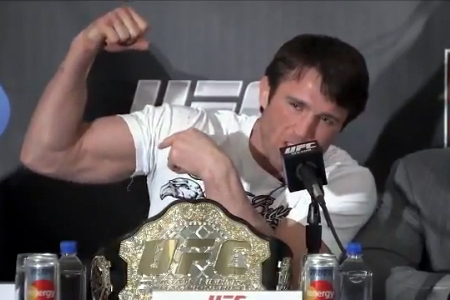 As game time steadily approaches, it’s hard to believe there’s anything more middleweight king Anderson Silva or Chael Sonnen (Pictured) can say about their heavily-hyped rematch that hasn’t already been spewed – especially after Monday’s explosive conference call. Nonetheless, FUEL TV will premiere “UFC 148 Primetime: Silva vs. Sonnen II” this Saturday at 7PM ET/4PM PT to see if they can further intensify the anticipation. Knowing fanboys just can’t get enough of MMA’s most heated rivalry, FUEL has released a sneak peek of this weekend’s 30-minute documentary. The sequel takes place July 7th inside MGM Grand Garden Arena in Las Vegas, Nevada.